I thought the Portuguese-loving states were. But then there's Portuguese in Family guy which is set in Rhode Island, so maybe there are a lot of them there? I'm a little surprised that BBQ wasn't there for NC, but I guess they're not mutually exclusive really. A lot of barbecue in NC is served at "Southern" restaurants. There are still 22 countries in the world that have not yet been invaded by Britain. Note that most of them are p. far inland. And not entirely true of Sweden, Britain used an island there as a naval port even during the Anglo-Swedish war. Some of those countries weren't even countries back when Great Britain wasn't invading them. That could be said of a lot of them. Man, I bet Guatemala is wondering why they can't get any love from Britain. They look so lonely there. There has to be a reason the British Empire didn't bother with Guatemala, too many mosquitos, maybe?. I mean, it's practically right next door to British Honduras (Belize). I can personally attest to how quiet some of those areas are. I lived in some very quiet places in SW Wyoming and SW Colorado, places where the wind blowing through the windows was the loudest noise... well, other than the occasional gunshot. I wonder how one could adjust it for population density or something like that. Stay out of my blue zones, you noisy fucks. I never realized exactly how loud it was in my semi-rural yard until I got hearing aids. Holy crap it's noisy out there. There are railroad tracks a mile away, the turnpike about three miles, and several smaller scale industrial parks within two to five miles, and I can hear all of them to the point of distraction now. And those stupid damned screeching birds too. Do your hearing aids have a convenient off switch? Yeah, it's called taking them out of my ears and opening the battery compartment. But just because I can't hear the sounds doesn't mean they're not there continuing to cause damage to my already damaged hearing. Your definition of convenient is different from mine. Also, if you put them back into your ears without the battery, would they provide healthy ear defence? Not the Phonak ones I have now. Though the Phonaks I have are right next to top of the line in their hearing aid line, they don't have an off switch or protect my ears at all. A few years ago, I had Lyric™ in-the-ear-canal hearing aids that were 30 dB earplugs when turned off via a little magnetic tool I carried on my key ring. However, Lyrics were not completely waterproof and new ones had to be inserted by an audiologist if removed or got wet or quit working. The built-in batteries were single-use items that lasted 4-5 months as I used them. The new ones, up to 4 pair per year were included in the $2400 per year annual lease. These were some high tech devices that could not be purchased, only leased, like GM's EV-1 electric car. 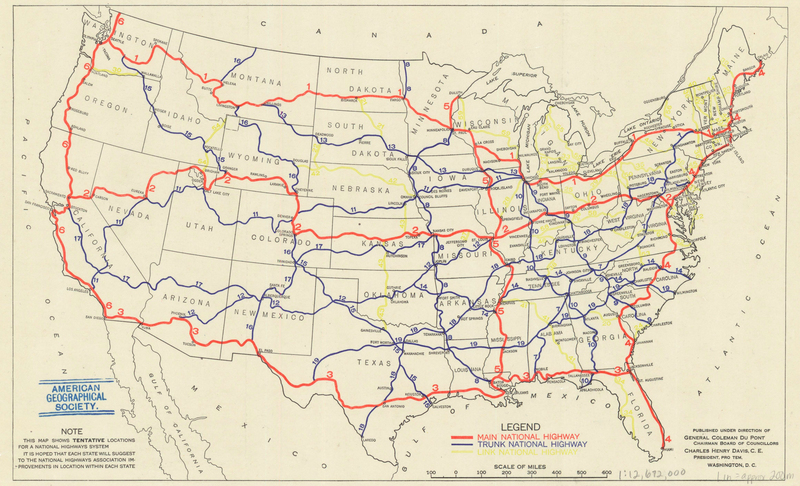 1913 Map of a National Highway System in the U.S. Apparently Las Vegas wasn't a thing in 1913. Last edited by Dingfod; 03-06-2015 at 08:07 PM. Technically, but it only incorporated in 1911, and didn't really achieve thing-hood until after WWII. Las Vegas in 1906. You will never find a more wretched hive of scum and villainy. And some of them aren't Mormons. 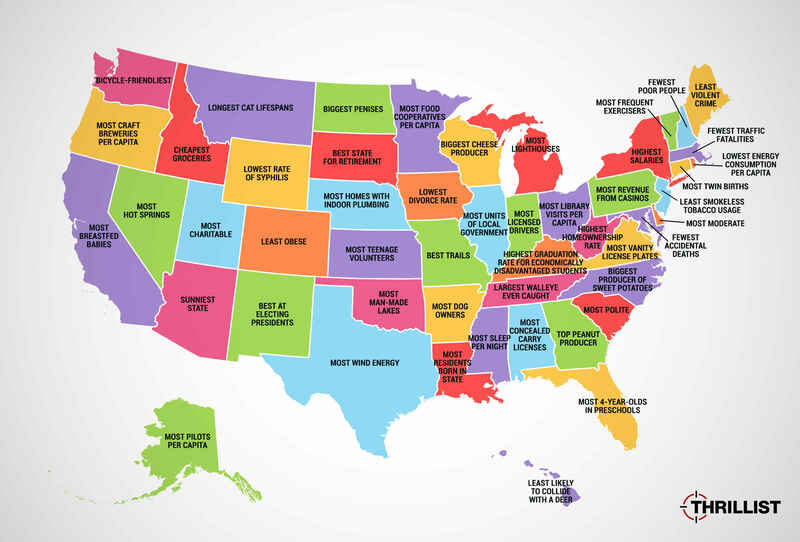 A map of what each state in the U.S. excels at. WERE TOO TOUGH FRO YOU NORTHERN BASTARDS!! Last edited by JoeP; 03-16-2015 at 04:20 PM.